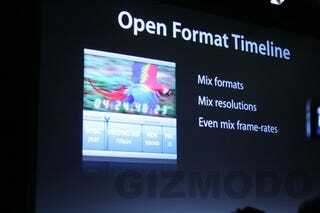 Apple introduced Open Format for Final Cut Pro, allowing you to mix different formats on the timeline. They say "it just works," and from the demo, looks like all kinds of formats can nicely live together on the same editing timeline, where they had to be transcoded to work together before. Then Apple showed some uncompressed 1080p footage with other resolutions and frame rates, all edited together in real time. Nice. They then showed us a side-by-side comparison of ProRes and uncompressed HD, and it was hard to tell the difference between the two. Then the kicker? The ProRes footage was 10th-generation. Impressive.